Colorful sponges and corals adorn the Adolphus Busch Sr., one of nine wrecks in the Florida Keys Wreck Trek. After a week of diving Florida's Upper Keys in rough conditions, we were encouraged by a forecast of diminishing winds and calming seas. The timing was perfect for a drive south through Marathon and over the Seven Mile Bridge past Bahia Honda State Park and on to Big Pine Key. The turquoise water and blue skies there are endless, and life slows to a true Keys pace. The following morning we took a 30-minute boat ride south to Looe Key. As the first boat there, we had our choice of moorings and selected one at the west end of the reef. We were amazed by the conditions and initial sightings — a passing reef shark, a resident 400-pound goliath grouper in the shade under the boat and 90- to 100-foot visibility. It was a great start to some of the best diving we've had in the Florida Keys. Looe Key is a spur-and-groove reef with coral fingers that extend out to sea, separated by white-sand channels. Located 6 miles offshore of Big Pine Key and Ramrod Key, Looe Key is entirely submerged; the depth ranges from 7 feet to 30 feet. The reef is shallow, but that doesn't preclude visits from large marine life such as reef sharks, spotted eagle rays, goliath groupers and big barracuda. Looe Key became a National Marine Sanctuary in 1981, following in the footsteps of the Key Largo National Marine Sanctuary that was established in 1975. Both areas were incorporated into the Florida Keys National Marine Sanctuary, which was designated in 1990. The Looe Key Existing Management Area covers 5.3 square nautical miles and includes the Looe Key Sanctuary Preservation Area (SPA) and the Looe Key Special-Use Research-Only Area. The sanctuary designation restricts spearfishing, lobster harvest and tropical fish collection and provides other protections for the reef. The research-only area is off limits to the public, giving scientists a controlled setting for studying the impacts of environmental change compared to those of human use. Good visibility is never guaranteed, but conditions were nothing short of spectacular during our visit. The reef's coral fingers make navigating the site easy. The shallows are covered in fan and soft corals that undulate in synchronized movement with the surge. In deeper areas are stands of elkhorn corals shading schools of French grunts. These delicate, endangered corals are susceptible to disease and temperature stress. Corals thrive in a narrow temperature range, and coral bleaching can occur with sustained temperatures outside this range. Shallow reefs around the world, including Looe Key and others in the Florida Keys, are particularly susceptible to warming from higher ambient temperatures. We found transplanted nursery-grown staghorn corals along with star, brain and fire corals as well as small but pristine pillar corals. A trio of eagle rays gracefully patrols the reef just above the coral. The reef is home to more than 150 species of fish. Grouper, parrotfish and hogfish are frequent customers at the plentiful cleaning stations. 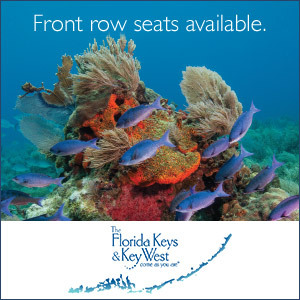 Abundant schools of sergeant majors, Atlantic spadefish, horse-eye jacks and midnight parrotfish pass through the reef. The inhabitants seem accustomed to divers, which is one of the pleasures of diving a marine protected area. The highlight of the day was a trio of spotted eagle rays that soared majestically just above the coral. We finished the day with a snorkel trip to American Shoal Lighthouse. The 109-foot-tall lighthouse, completed in 1880, sits in the middle of the sanctuary. Offshore of Sugarloaf Key, American Shoal stands in 5 feet of water and was the last of six lighthouses constructed in the Florida Keys to warn mariners of dangerously shallow reefs. The local birds, now the sole residents, aggregate on the structure to dry their wings in the sea breezes. In the flat sand and rubble beneath the lighthouse are the usual suspects: barracuda and small schools of grunts, snapper and sergeant majors. Schools of grunts huddle beneath large stands of elkhorn coral. For our next trip to Looe Key we decided on a private charter to explore the deeper areas of the reef and the wreck of the freighter Adolphus Busch, which was sunk in 1998 between Looe Key Reef and American Shoal. The ship was sunk within the Florida Keys National Marine Sanctuary, so explosives were not used because the concussion might harm marine life. Instead 12 holes were cut in the ship above the waterline, and water was pumped into the hull. The 210-foot-long ship slipped beneath the waves on Dec. 5, perfectly upright at 110 feet. Adolphus Bush IV, an avid diver and great-grandson of one of the founders of Anheuser-Busch, donated $200,000 to help purchase, prep and sink the vessel, which was then known as the Ocean Alley. The ship was rechristened the Adolphus Busch Sr. and is part of the Florida Keys Wreck Trek, a series of nine wrecks from Key Largo to Key West. Conditions were again excellent, with water so clear we could see almost the entire ship from the mooring ball. We had the Busch to ourselves, and the descent down the mooring line was easy with very little current. The marine life was timid, and the three resident goliath groupers kept their distance, watching us cautiously. A school of barracuda eyed us intently as we got nearer to the wreck. A school of permit patrolled the wheelhouse at around 70 feet. Two lionfish declared themselves captain and first mate and were two of only a few of that invasive species that we saw on all our dives. In summer the wreck is thick with silversides as warmer Gulf Stream waters move closer. Moray eels, lemon sharks and schools of grunts and snappers frequent the site. The vibrant colors of the corals and sponges were muted somewhat by a layer of silt covering the wreck. A midnight parrotfish exits a cleaning station nestled in pillar coral. The deep reef area has flat, gently sloping terrain in depths from 50-100 feet. Currents can be strong at depth. Two reef sharks greeted us, while angelfish, schools of grunts and Atlantic spadefish swam among the soft corals and large barrel sponges. Our final dive of the day was at the eastern end of Looe Key, an area where the reef is more dramatic with steeper coral formations and more pronounced ledges. Barracuda were plentiful, large rainbow parrotfish chomped on the coral, and schools of gray snapper and yellowtail were abundant. This reef was absolutely stunning in the late-afternoon light. Large marine life such as reef sharks are frequent visitors to Looe Key, even in the shallows. A few days later we dived with one of the local dive operators. Unfortunately, the beautiful conditions we'd experienced earlier had deteriorated, and visibility was only 30-40 feet. The dives were still enjoyable, and we explored beyond the tips of the coral fingers in the flat sandy areas thick with giant barrel sponges and were fortunate to witness the wondrous display of spawning sponges. This spawning may have contributed to the diminished water clarity, but it was inspirational to observe the fecundity of the sea. Our return to shore was a special treat, as we enjoyed a close encounter with a large pod of bottlenose dolphins joyously surfing our stern wake. Visitors to the Florida Keys should not miss Looe Key. A scenic hour-and-a-half-long drive south from Key Largo or a half-hour drive north from Key West will bring you to this Lower Keys paradise where there are dives appropriate for all skill levels. The shallow reefs and bright white sands provide wonderful lighting for underwater photography, and the lovely corals and plentiful marine life will beguile divers and snorkelers alike. It's almost certain you'll be welcomed by one of the large resident goliath groupers, a success story in marine conservation. Big Pine Key is 26 miles north from Key West International Airport and 20 miles south of Florida Keys Marathon Airport. Shuttle buses, taxis and car rentals are available at both airports. As is typical throughout the Florida Keys, most air arrivals connect through Miami International (MIA) 133 miles to the north. Flying into Miami allows diving in other Keys spots along the way southward. If you have the time, they have the dive diversity. Dive operators leave for Looe Key from Big Pine and Ramrod keys. Diving is year-round, though the summer features calmer seas, warmer water and better visibility. The Keys have a subtropical weather bias — very warm in the summer and mild in the winter. Air temperatures range from 75°F to 80°F in winter and 85°F to 90°F in summer. Water temperatures range from a low of 72°F in winter to 85°F in summer. The Lower Keys are home to the Florida Keys National Wildlife Refuges Complex, which encompass 410,000 acres of protected land and water. The complex comprises four refuges: Key West National Wildlife Refuge (NWR), Great White Heron NWR, Crocodile Lake NWR and National Key Deer Refuge. The National Key Deer Refuge is the only habitat of Key deer. This is the smallest subspecies of the North American white-tailed deer and is federally listed as endangered. Most easily spotted on Big Pine Key at dawn or dusk, these animals are highly protected to ensure their survival in their natural habitat. Once almost extinct, they now number close to 1,000. Speed limits are aggressively enforced in Big Pine Key, specifically to protect Key deer from being killed by cars. Bahia Honda State Park, often appearing on lists of the top-10 beaches in the U.S., is 12 miles south of Marathon. The 524-acre park offers boating, camping, kayaking, fishing and snorkeling trips to Looe Key. The sun setting behind the pilings of the abandoned Bahia Honda Rail Bridge, a remnant of Henry Flagler's "Railroad that Went to Sea" (the Florida East Coast Railway Key West Extension), is a treasured and iconic Keys visual. See more of Looe Key in an online bonus photo gallery.